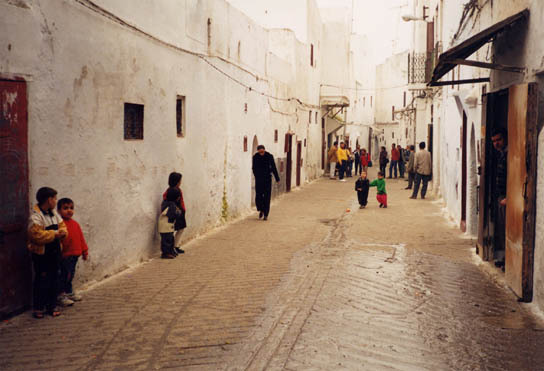 One of my business contacts in Fez palmed a piece of hashish into my pocket as we kissed cheeks and patted backs. He asked why the several people I'd brought through his rug souk over the years had not purchased. I told him I thought it was because what he showed was too large, too expensive and not particularly special. Each person I worked with was mature, independent, bright, and obviously showed taste in how they spent their discretionary income - traveling with me through Morocco. Mohamed, my rug merchant friend, laughed like I'd made a joke, then asked what rugs I wanted to see. I retorted that fate caused our paths to cross again, but rugs did not play a part. He was quick to assure me fate, indeed, intended me to become the owner of several new rugs, saying: "I've gut sumzing veddy veddy special to show jdyou". His helpers rolled rug after rug out for my inspection, one by one. They soon resembled the stack of rugs a Mosque floor often sports. Two particularly fine pieces were saved until last and both were truly special. One of the two I wanted. I hope it didn't show. I refused to make an offer, instead waiting until Mohamed made me a group price for three rugs. I gradually warmed to the bargaining and offered about a quarter of the asked price. "Do you think I deal in shoddy merchandise?" asked Mohamed, wearing a hurt look. I thanked him for his time and gave baksheesh to the guys who had unfurled and then again rolled up fifty rugs. "Mohamed, my friend, thank you again. You have a beautiful shop and an adequate selection of rugs. You simply want too much money from each transaction", I said. And I took five steps toward his door before he had me by the arm, reseating me by the empty mint tea service.